Integrated solar battery; glucose-powered implantable sensor. 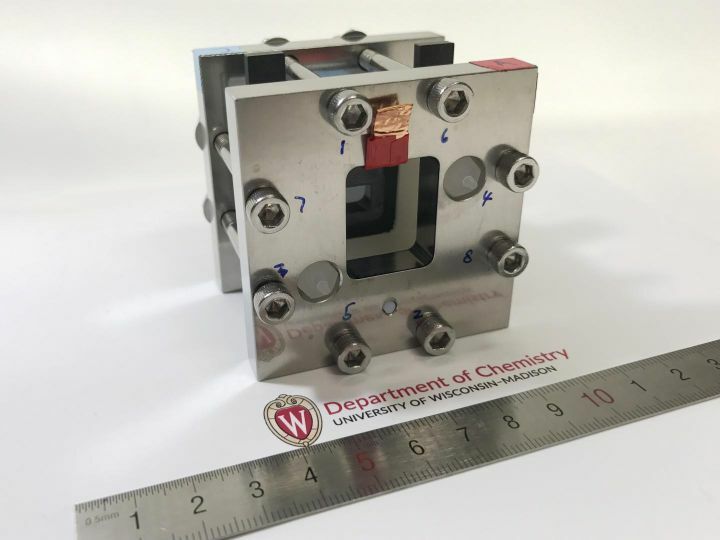 Researchers at the University of Wisconsin–Madison and King Abdullah University of Science and Technology (KAUST) built a unified solar cell-liquid battery device capable of returning more than 14% of the incoming solar energy as electricity. The device is capable of both converting solar energy to electricity for immediate use or storing it as chemical energy in a flow battery. An improved storage method could help overcome the problem of intermittent energy supply, which is already limiting the adoption of solar in Denmark. “Twenty years ago, solar cell development was the key to solar energy. Today, it’s storage,” argues Song Jin, a professor at the University of Wisconsin-Madison. The redox-flow battery used in the system operates on the same principle as existing batteries that store energy in large liquid tanks, which in some cases are already used to store energy for the electricity grid. Part of the device’s success was the use of an expensive, highly efficient solar cell, but they believe a lower efficiency cell could still work well. The first applications of the system could be in in off-grid, standalone energy systems where there are no utility lines able to transmit and use extra photovoltaic electricity, Jin said. The team also expects the efficiency to increase – their first proof of concept two years ago provided only 1.7% efficiency. Future efforts will focus on better matching the voltage of the solar cell to the voltage of the oxidation-reduction reactions in the flow battery. 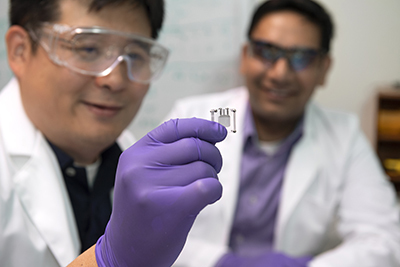 Researchers at Washington State University designed an implantable, biofuel-powered sensor that runs on sugar and can monitor a body’s biological signals for disease detection and diagnosis. The biofuel cell runs on glucose harvested from body fluids, while the sensor is capable of processing physiological and biochemical signals with high sensitivity. The team sees the implantable device as more practical than wearables or skin patches for detecting disease. It could potentially eliminate the need for finger prick tests for diabetes. The electronics in the sensor consume only a few microwatts of power, which, in combination with the biofuel cell, makes it more efficient than traditional battery-powered devices, according to Gupta. Since it relies on body glucose, the sensor’s electronics can be powered indefinitely. So, for instance, the sensor could run on sugar produced just under the skin. Additionally, the biofuel cell is also completely non-toxic, making it more promising as an implant. It is also more stable and sensitive than conventional biofuel cells. The researchers say the sensor could be manufactured cheaply through mass production.